If only he existed, top British spy James Bond could be sitting at a local nightspot, enjoying his favourite poison, shaken, not stirred. After all, every variation from an A-tini to Z-tini is available at the Martini Innercity Festival 2008 (MIC). If only he existed, top British spy James Bond could well be sitting at a local nightspot and enjoying his all-time favourite drink, shaken, not stirred. After all, every variation imaginable from an A-tini to Z-tini is being made available at the Martini Innercity Festival 2008 (MIC). Martini lovers in Singapore – purists and experimentalists alike, are joined by martini newbies in celebrating the release of an intoxicatingly wide range of 133 concoctions this July. The festival kicked off at the Clarke Quay Central Square on July 10, with many booths manned by the various participating outlets sparking the curiosity of passers-by. UrbanWire spoke to university student Adele Seet, who was spotted eyeing the crowd from afar. “I’m quite excited to hear that there’s a Martini Festival. I don’t think I’ve ever seen this many concoctions before!” she gushed. There were 5 Martinis per booth that were up for sampling and few could resist having a taste of some of the brightly-coloured creations. Drawn by the visual feast, Adele and her group of friends then decided to give the martinis a try. Here’s a heads-up for all UrbanWire readers who’d like to taste more of the tantalising Martinis lined up for the next 3 weeks of the festival. Oh where, oh where can my Martini be? Well, you’ll probably be glad to know that you won’t have to resort to the hot and noisy hawker centres to enjoy cheap martinis. You can sign up for the MIC Passcard at any participating outlet for $99. Just flash the card and tadah! you’ll get your Martini, and have another 19 to look forward to. But if you don’t see yourself downing 20 martinis within 3 weeks, rest assured that the card is transferable, so feel free to share it among your friends. Do the math and you’ll realise how much you’ll save, with each martini costing less than $5! Sweet or Sour, Cacao or Fruity? So you’ve chosen your preferred watering hole. What’s next? If you’d like to start with something mild and sweet, we recommend the Strawberry Martini at Thumper. 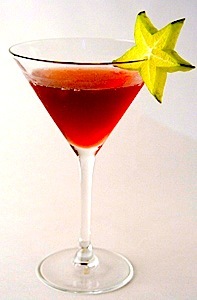 It was wildy popular at the festival launch, with 3 in 5 people in the queue ordering the striking red Strawberry-tini. Those who love to tingle their tastebuds with a sour drink may prefer the Honey Sparkles at Geek Terminal that features honey plum wine. The conventional gin, vodka and lime juice mix is starting to make way to the increasingly popular cacao and fruity concoctions. Chocolate lovers will definitely enjoy the Hershey’s Martini at Zouk, with Hershey’s Chocolate syrup flowing down the walls of the glass, oozing sinful delight. If you aren’t very familiar with martinis, take a peek at the Martini Innercity Festival website for pictures. This might just save you the embarrassment of picking up the wrong drink, although it could prove to be useful in some impromptu networking or making a new friend, as UrbanWire discovers. With 133 Martinis to choose from, it’s best that you acquaint yourself with the more unusual concoctions so that you’ll never get tongue-twisted with these creative names, unless you had a few glasses too many. So whether you prefer it shaken the 007 way or stirred the traditional way, here’s to a delightful month of Martinis. Cheers! The Martini InnerCity Festival 2008 runs from July 11 to July 31. For more information on the festival, visit www.mic.sg.